Welcome to the LitCharts study guide on Margaret Atwood's Alias Grace. Created by the original team behind SparkNotes, LitCharts are the world's best literature guides. A concise biography of Margaret Atwood plus historical and literary context for Alias Grace. A quick-reference summary: Alias Grace on a single page. In-depth summary and analysis of every chapter of Alias Grace. Visual theme-tracking, too. Explanations, analysis, and visualizations of Alias Grace's themes. Alias Grace's important quotes, sortable by theme, character, or chapter. 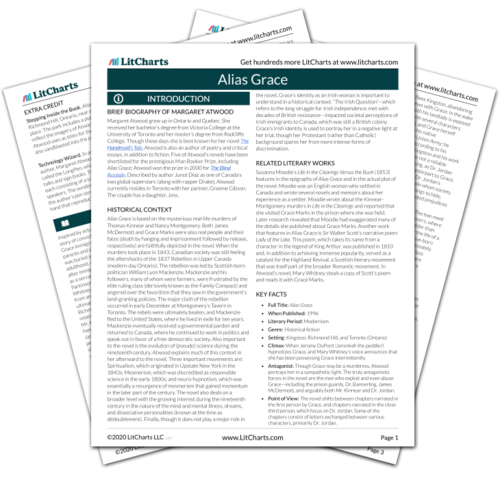 Description, analysis, and timelines for Alias Grace's characters. Explanations of Alias Grace's symbols, and tracking of where they appear. An interactive data visualization of Alias Grace's plot and themes. Margaret Atwood grew up in Ontario and Quebec. She received her bachelor’s degree from Victoria College at the University of Toronto and her master’s degree from Radcliffe College. Though these days she is best known for her novel The Handmaid’s Tale, Atwood is also an author of poetry and critical essays, in addition to fiction. Five of Atwood’s novels have been shortlisted for the prestigious Man Booker Prize, including Alias Grace; Atwood won the prize in 2000 for The Blind Assassin. Described by author Junot Díaz as one of Canada’s two global superstars (along with rapper Drake), Atwood currently resides in Toronto with her partner, Graeme Gibson. The couple has a daughter, Jess. Alias Grace is based on the mysterious real-life murders of Thomas Kinnear and Nancy Montgomery. Both James McDermott and Grace Marks were also real people and their fates (death by hanging and imprisonment followed by release, respectively) are faithfully depicted in the novel. When the murders took place in 1843, Canadian society was still feeling the aftershocks of the 1837 Rebellion in Upper Canada (modern-day Ontario). The rebellion was led by Scottish-born politician William Lyon Mackenzie. Mackenzie and his followers, many of whom were farmers, were frustrated by the elite ruling class (derisively known as the Family Compact) and angered over the favoritism that they saw in the government’s land-granting policies. The major clash of the rebellion occurred in early December at Montgomery’s Tavern in Toronto. The rebels were ultimately beaten, and Mackenzie fled to the United States, where he lived in exile for ten years. Mackenzie eventually received a governmental pardon and returned to Canada, where he continued to work in politics and speak out in favor of a free democratic society. Also important to the novel is the evolution of (pseudo) science during the nineteenth century. Atwood explains much of this context in her afterward to the novel. Three important movements are: Spiritualism, which originated in Upstate New York in the 1840s; Mesmerism, which was discredited as responsible science in the early 1800s; and neuro-hypnotism, which was essentially a resurgence of mesmerism that gained momentum in the later part of the century. The novel also deals on a broader level with the growing interest during the nineteenth century in the nature of the mind and mental illness, dreams, and dissociative personalities (known at the time as dédoublement). Finally, though it does not play a major role in the novel, Grace’s identity as an Irish woman is important to understand in a historical context. “The Irish Question”—which refers to the long struggle for Irish independence, met with decades of British resistance—impacted societal perceptions of Irish immigrants to Canada, which was still a British colony. Grace’s Irish identity is used to portray her in a negative light at her trial, though her Protestant (rather than Catholic) background spares her from more intense forms of discrimination. Susanna Moodie’s Life in the Clearings Versus the Bush (1853) features in the epigraphs of Alias Grace and in the actual plot of the novel. Moodie was an English woman who settled in Canada and wrote several novels and memoirs about her experience as a settler. Moodie wrote about the Kinnear-Montgomery murders in Life in the Clearings and reported that she visited Grace Marks in the prison where she was held. Later research revealed that Moodie had exaggerated many of the details she published about Grace Marks. Another work that features in Alias Grace is Sir Walter Scott’s narrative poem Lady of the Lake. This poem, which takes its name from a character in the legend of King Arthur, was published in 1810 and, in addition to achieving immense popularity, served as a catalyst for the Highland Revival, a Scottish literary movement that was itself part of the broader Romantic movement. In Atwood’s novel, Mary Whitney steals a copy of Scott’s poem and reads it with Grace Marks. Antagonist: Though Grace may be a murderess, Atwood portrays her in a sympathetic light. The truly antagonistic forces in the novel are the men who exploit and even abuse Grace—including the prison guards, Dr. Bannerling, James McDermott, and arguably both Mr. Kinnear and Dr. Jordan. Point of View: The novel shifts between chapters narrated in the first person by Grace, and chapters narrated in the close third person, which focus on Dr. Jordan. Some of the chapters consist of letters exchanged between various characters, primarily Dr. Jordan. Stepping Inside the Book. Alias Grace Park is located in Richmond Hill, Ontario, near where the 1843 murders took place. The park includes a playground and sculptures that reflect the imagery of Atwood’s novel. Quilt patterns, which Atwood uses as titles for the fifteen sections of the novel, are also sandblasted into the pavement of the park. Technology Wizard. In addition to being a prize-winning author, Margaret Atwood is also the developer of a technology called the LongPen, which allows authors to remotely give book talks and sign books. The LongPen is made of two terminals, each consisting of a screen, webcam, microphone, and speakers. The sending terminal also has a tablet, which records the author’s pen strokes. The receiving terminal has a robotic hand that reproduces these strokes, thus autographing a book. Grimm, Alexandra. "Alias Grace." LitCharts. LitCharts LLC, 7 Feb 2018. Web. 20 Apr 2019. Grimm, Alexandra. "Alias Grace." LitCharts LLC, February 7, 2018. 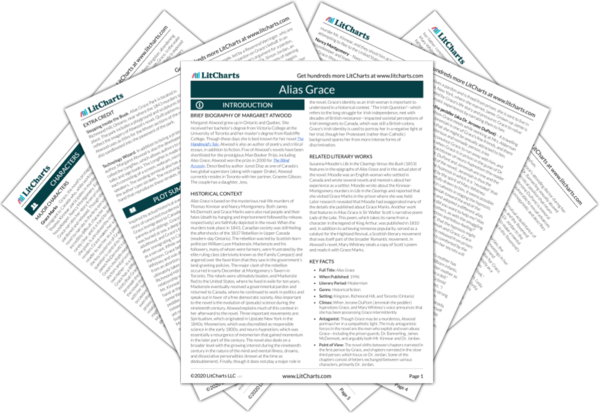 Retrieved April 20, 2019. https://www.litcharts.com/lit/alias-grace.